As my last scratch-build of 2009, I thought it was time I would have a go at building a square rocket. So here I present Rocket Squared or Rocket2! Built using a central core of BT50 body tube with four strips of balsa glued around the outside. 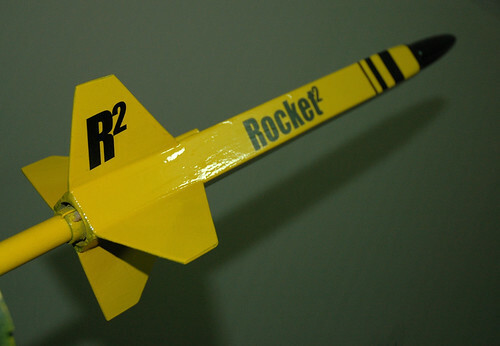 The rocket stands 42cm (or 16½") tall and has a 18mm motor mount. I have no idea how to build this in Rocksim?! I spent some time trying to build a square nose cone but nothing looked quite right, so I sanded down the corners of the top-end of the airframe and stuck in a round one. Launch report to follow!